New order form for Custom Nmae ornaments. After the server went down the other day I lost the order form for the Christmas name ornaments. I have a new form up. All the orders were saved so no need to resubmit. I used a different form generator this time that offers better features. The old form program is what caused the server problem the other day. I want to thank all of you who submitted orders. I have a few hundred to make so some will take a few days to get finished. I'll try to keep you posted on my progress. The Ornament Patterns are $5 for 5 name minimum. Each additional name is $1 per name. 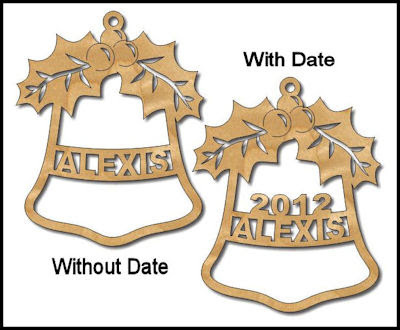 You can order the ornaments with or without the date, pictured above. You will only pay when you receive the pattern and are satisfied. I will send a link with the pattern to make payment through Paypal. You do not need a Paypal account to pay with a credit card. The online payment is processed through a secure network. You can also send payment by US mail. Cash, check or money order accepted.